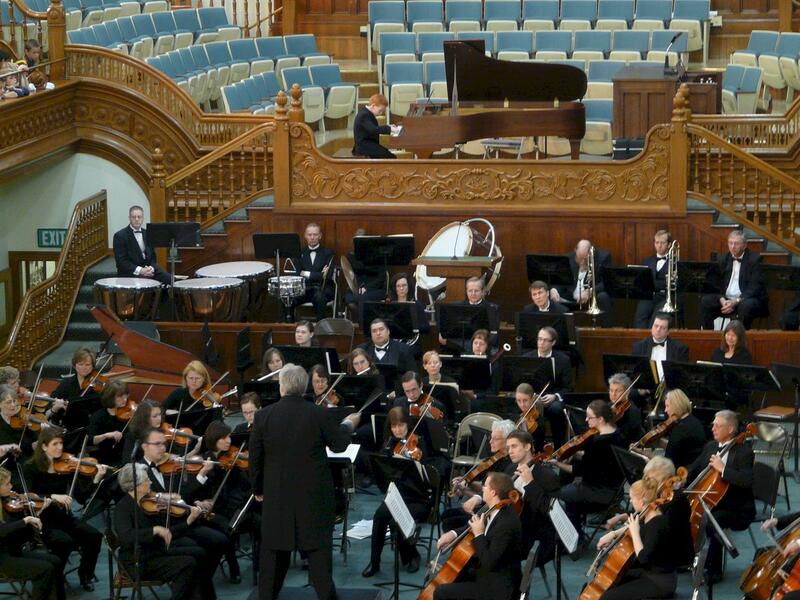 The Provo Tabernacle had been the performance home of the Utah Valley Symphony for 40 years. In the fall of 2007 the Utah Valley Symphony moved to the Covey Center for the Arts for our performance hall. However, we returned every November to hold School Concerts for local children. Even though we moved locations, our hearts were still left in the Provo Tabernacle. 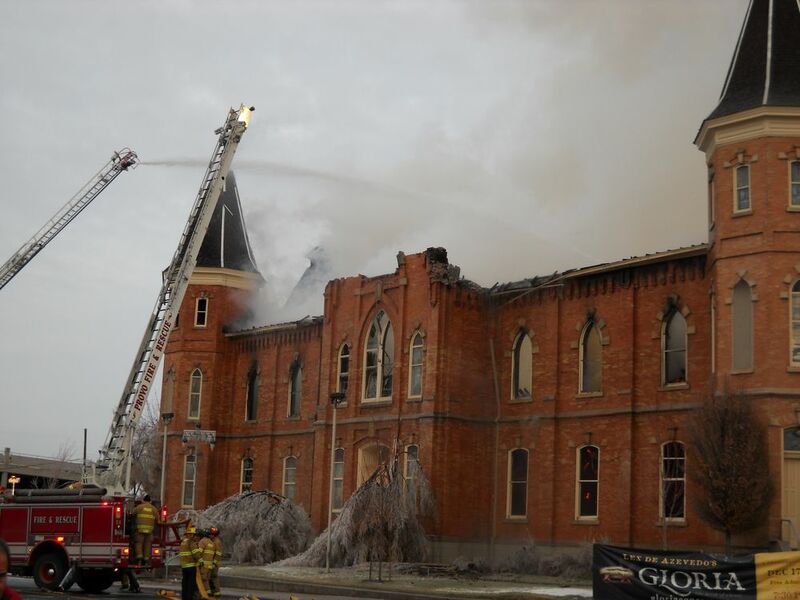 On the morning of December 17, 2010 tragedy struck the heart of Provo when a fire destroyed nearly all the building. For the musicians of the Utah Valley Symphony it was especially heart wrenching. We deeply loved the Provo Tabernacle. We remember with fondness the kind acoustics and how the 'stage' drew in the audience. We remember how fitting a 9 foot grand piano onto the portable stage for our Young Artists Concert was always a bit of a trick to get it and everyone else on stage. The women remember the mad dashes at intermission to the ladies restroom that had only 2 stalls. Those musicians who sit close to the conductor recall that the conductor's podium was situated on a seam of the portable stage. During a particularly energizing part in the piece, the podium would make the seam creak and the 1st stands shake. We all chuckled how our Conductor's car was towed because he parked in the wrong spot. We remember performing Saint-Saens' Organ Symphony with Walter Whipple (UVS cellist and oustanding organist) making those pipes sing. We recall performing a full cycle (?) of Beethoven's Symphonies. The feelings captured at the Provo Tabernacle will remain engraven on our hearts. Most of all we remember that the Provo Tabernacle was not just a building, but a home to all who entered as their hearts were touched in some way. As a representative of the Utah Valley Symphony, I just wanted to write and express how heartbroken we feel over the loss of our "home" for many years and our hope and support for the rebuilding of the Provo Tabernacle. As a young girl, I was brought to the Provo Tabernacle to hear the Utah Valley Symphony concerts with my neighbor and violin teacher, Helen Robinson. At the time, she was the Concert-mistress of the orchestra and I would watch and listen with rapt attention. I would also memorize the names of the violinists never imagining that one day I would play in the group with many of them. My favorite place to sit was always the balcony. I could see everything. The way the lights in the ceiling spelled "HI"; the kids across the tabernacle from me daring to drop a program over the edge; Alan, my teacher's handsome son who played the French horn, and the pipes of the grand organ. I'll never forget the sound of that organ when we played the exquisite Saint-Saens Organ Symphony. It makes me cry to think of it. We loved playing in the Tabernacle. There was a special feeling there that we could never quite capture at other venues. The sound was active and friendly and the hall was beautiful. How sad we were to see the devastation. We are hopeful that those who are in authority to make decisions about our beloved building, will feel, as we do, that it is a magnificent and important piece of architecture, a place of a million memories, and for us, a place for beautiful music making. 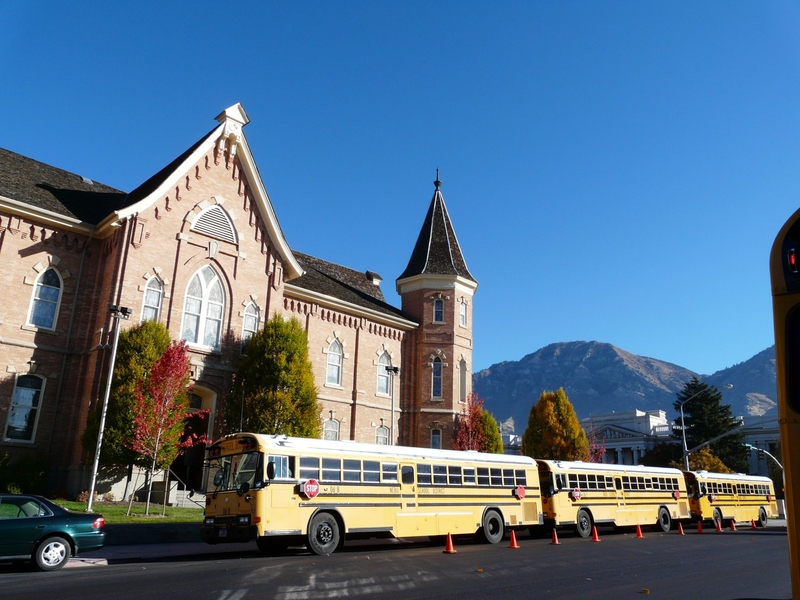 We offer our support for the rebuilding of the Provo Tabernacle.